It was time for another Mets game with my friend Bill, so we knew to start the night off with a pre-game, ethnic meal in Queens last night. This time we chose to try Spicy Mina, a Bangledeshi restaurant. WOW! It was really an experience- so flavorful with unique spices – somewhat similar to Indian food, but definitely had it’s own trademark on flavor. For starters, we ordered the Samosa Chat (vegetable fritters served with hot tangy sauce, prepared with yogurt chat masala). For entrees we went with the Chicken Jhaal Fry (chicken cooked with onion and hot traditional spice) and the Lamb Vindiallo (lamb cooked in a hot and tangy curry sauce). We had the waiter choose a vegetable dish for us – I think this is what it was: Chana Masala with Puri (Chick peas prepared with Bangladeshi spices served with puri) – whatever the correct name, it was like a chick pea risotto. But wait, there’s more — we also ordered the Onion Kulcha, which is nan stuffed with seasoned green onion. What a meal, I wish my words did it justice. The dishes did not come out five minutes after ordering, you could tell they were cooked to order. 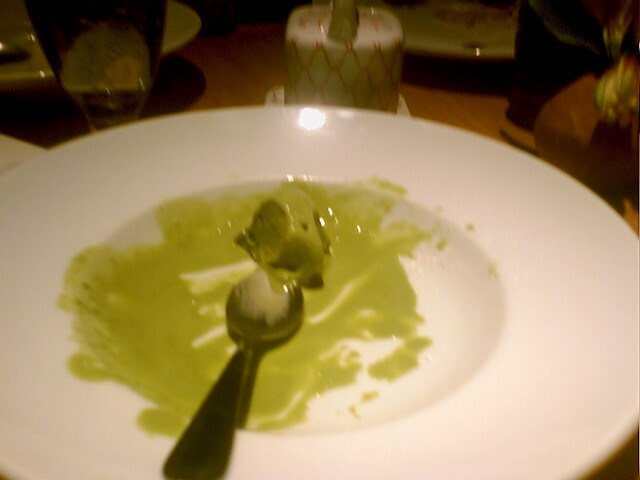 We finished it off with their specialty dessert – rice pudding. We split an order, which came out to be about 3-4 spoonfuls each, which was just enough sweetness to top of the incredible meal. 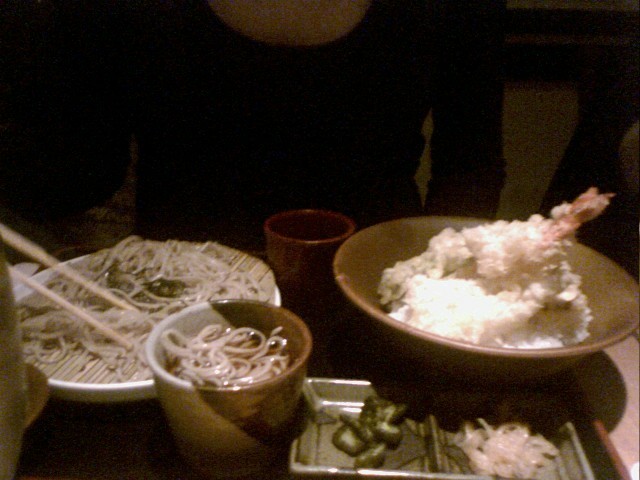 I was so engrossed in our special meal, that I forgot to take photos (I’m sorry! 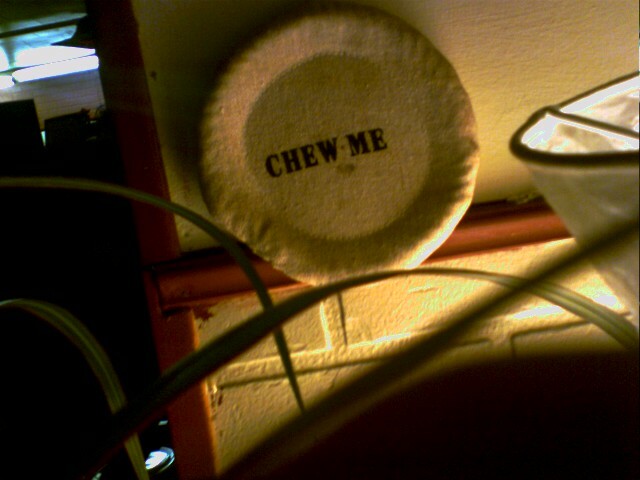 ), but I did remember to take a photo of this one piece of “artwork” that was hanging behind me. Spicy Mina is so easy to get to from Manhattan — the R or the V will take you right to the corner where the restaurant is located (65th Street stop). I got there in 20 minutes by taking the R from 59th and Lexington. Sidenote: there were these colorful green chili peppers in the chicken dish. Bill insisted that it was a “clean hot”, so I took a small bite and thought I could handle it. I nodded, told him he was right, but then a few seconds later I broke out into a sweat and almost thought I was going to cry. Maybe there was smoke coming out of my ears, like in the cartoons. It took a good five minutes to recover. So eat at your own risk!! I was just checking out New York Magazine’s 2007 Cheap List — two places that have already been written about on Umami Mart are included on their list: Little Pepper and Boi to Go! Hopefully we can check out the whole list and blog about all of them! 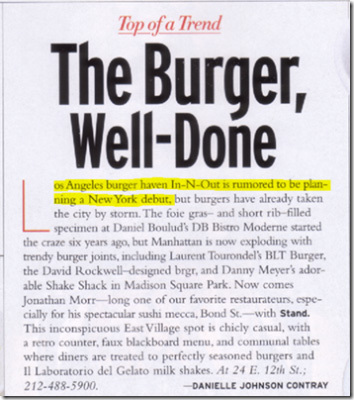 In-N-Out Burger Coming to NYC??? Via eater.com, I came across a post on this blog that says Departures magazine has a mention that In-N-Out may be coming to NYC! If you are a Southern California native like myself — or have done their drive thru — you understand how exciting this. I’ve always said this joint would do so well in NYC – the lines would be outrageous, but I’d be waiting in line to get my cheeseburger with all the fixins’!! Back to Shea Stadium for some Mets action last night, so you know what that means…back to the last stop on the 7 train for some szechuan. This time my friend Bill and I tried Little Pepper, a place we hear gives Spicy and Tasty a run for its money. 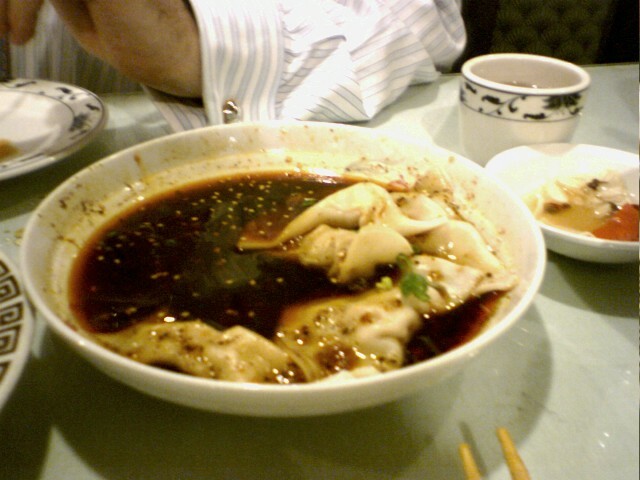 Then it was the Dan Dan Noodles — I must say, these beat out Spicy and Tasty’s, in my humble opinion. A generous portion of warm noodles with amazing flavors. For the main course we had the lamb with spices and enhanced pork. 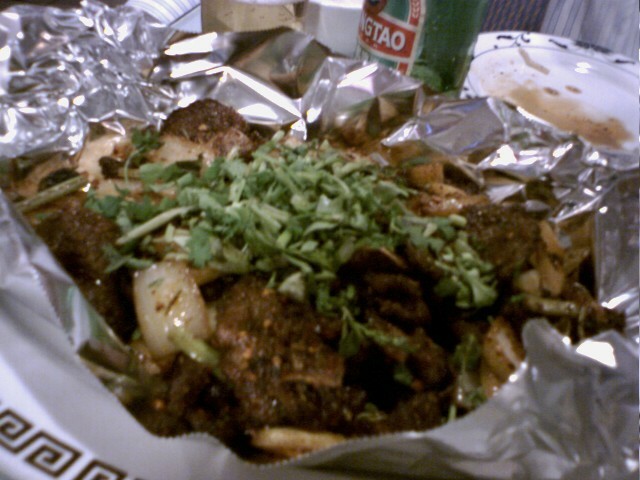 To our surprise, the lamb was very middle-easternesque because of the spices – especially cumin. 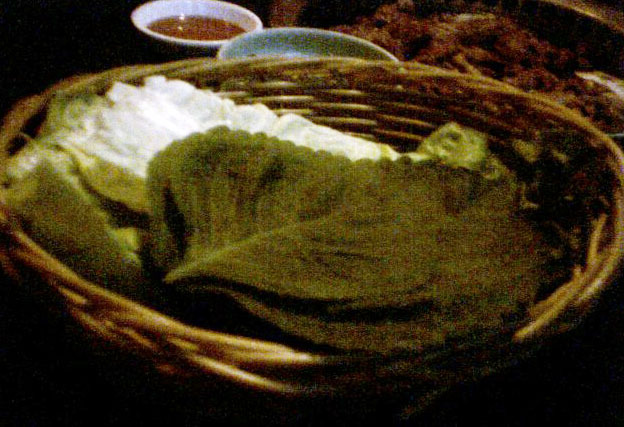 It was delicious, but if you were blind-folded, you wouldn’t think you were eating this in a Chinese restaurant. Okay, that makes me feel better. 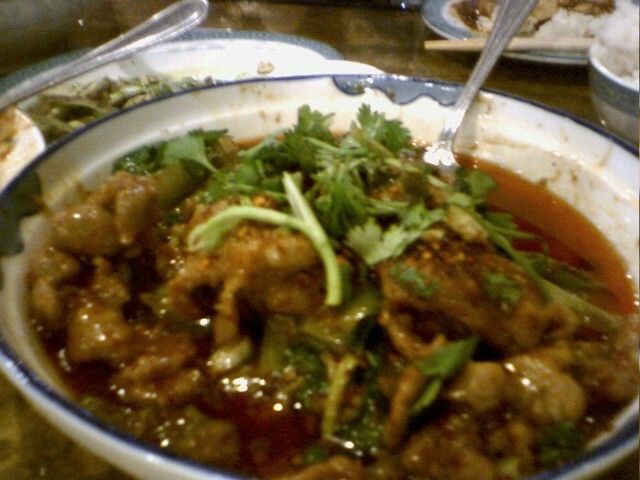 It actually tasted very similar to twice cook pork to me – not so much spicy as it was salty. I still can’t put a finger on it, but something was so spicy (in a good way) that I came this close to shedding a tear!! If I had a gun to my head (by who? the szechuan hostages?! ), I think I’d have to pick Spicy and Tasty (you just can’t beat the sauteed pork), but if I were forced to go back to Little Pepper, it’s not like i would be kicking and screaming all the way there…probably skipping and smiling. 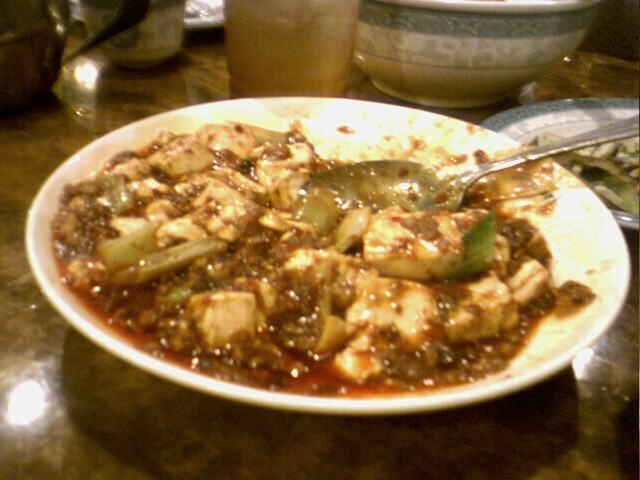 I was introduced to this unbelievable szechuan restaurant called Spicy and Tasty in Queens by my friend Bill. We are avid Mets fans, so we try to get there as often as we can when we’re headed to a ballgame. 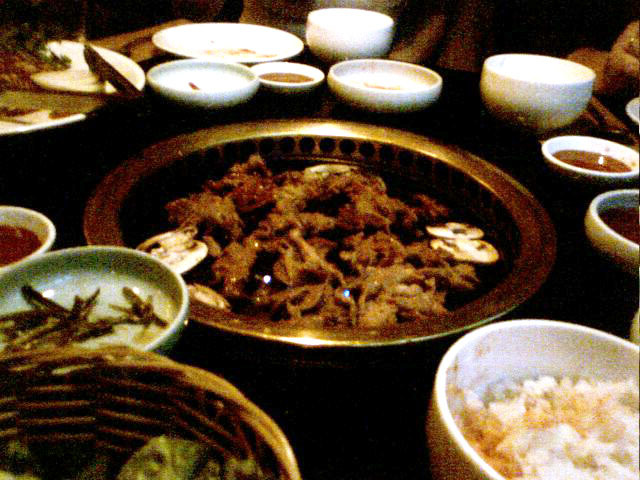 I took my friends Kevin & Bea there last night before we went to see watch some baseball. I am proud to say I think they are hooked as well! I was very lucky to dine with them last night as they are total foodies like me – and Bea speaks chinese, so she served as a valuable interpreter for us! Unfortunately I just look the part. The only thing I requested (okay, demanded!) was that we order the shredded pork in fresh hot pepper. TO DIE FOR! The word succulent comes first to mind. Trust me, you have this dish once, and you will be craving it again for days (and no NYC restaurant has anything like it – trust me, I’ve been searching). 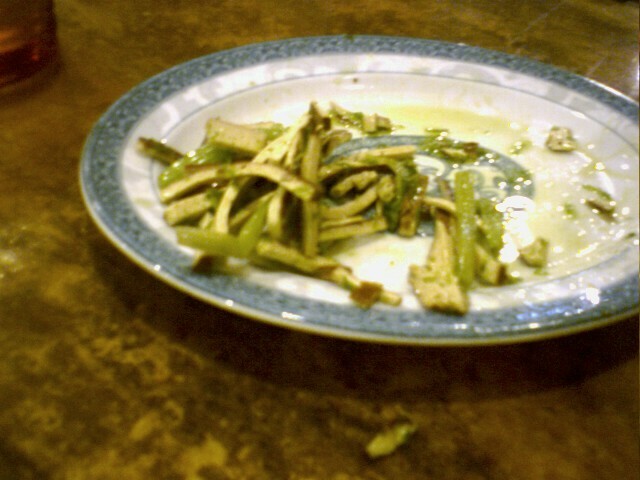 For an appetizer, Bea ordered us the shredded dry bean curd with celery. 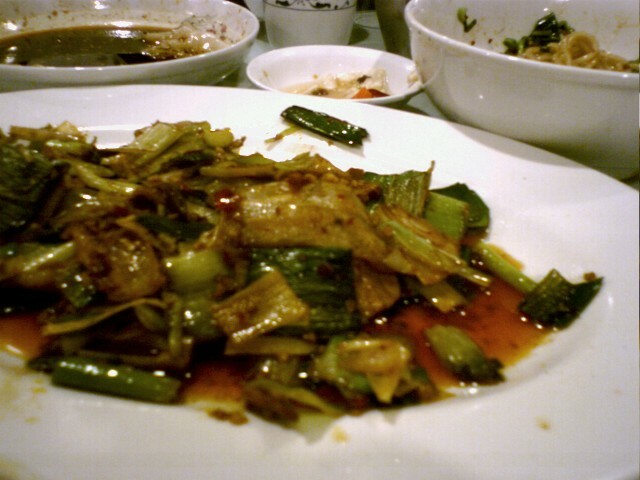 Very good – and a perfect summer dish as it had a refreshing taste to it (and the only non-spicy thing on our table)! If she wasn’t with me, I would’ve never have thought to have ordered this dish. Lucky for you guys, I remembered to snap a photo with only about three bites left! Phew! 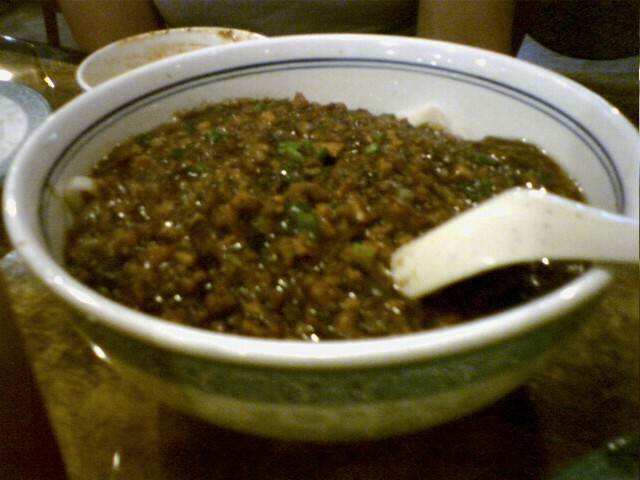 In addition to the pork, we had two other main dishes – the bean curd with minced pork (silky!) 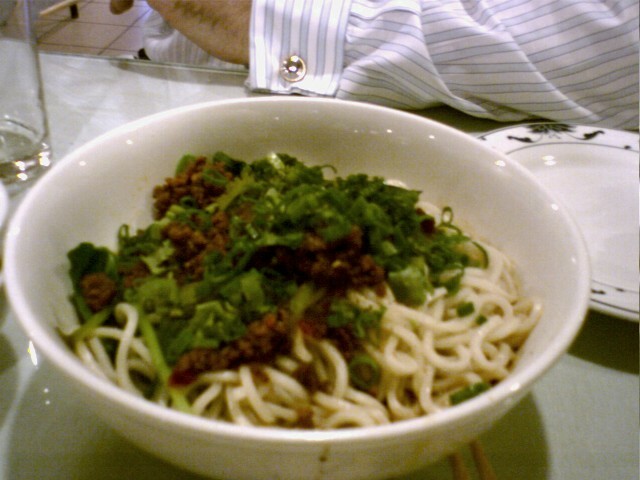 and the noodles with minced meat (delectable!). Both were just as pleasing to the tastebuds. I highly recommend this place to meat eaters and those who definitely LOVE things with a KICK. Bland eating vegetarians need not apply. Don’t be embarrassed if you get a runny nose or break out into a sweat. It’s called Spicy and Tasty for a reason! The “S&T” is located at 39-07 Prince Street at 39th Street… so easy to get to on the 7 Train. Enjoy!! Wow, this is my first time blogging! How exciting. Anyway, MRoach introduced Aya A. and two JS alums, yours truly and Gayle, to Do Hwa — a great Korean joint in the Village (55 Carmine Street b/t Bedford & 7th Ave S). We did not leave hungry…that is for sure! I specifically took the photos with my cell for Umami Mart! 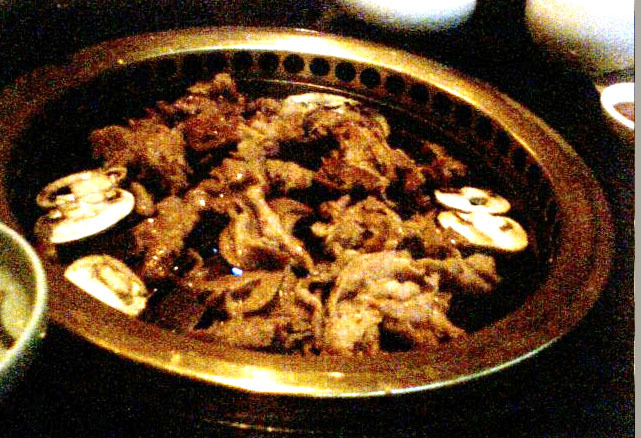 Above are photos of our Deji Bulgogi (thin slices of pork in a spicy chili pepper marinade)…..soooo good!! It helped that Mel was the best BBQer, making sure the meat was getting cooked equally on both sides! 🙂 You wrap it in the lettuce & shiso leaves (last photo). To start we had kimchi pancakes and a fried oyster appetizer. We also had two kinds of soups – Mandu D’uk Gook (homemade dumpling soup with rice cakes…which was more like mochi — YUM) and another one, which I think was Dwen Jang Chigae (dark miso soup with vegetables and beef). The place is very cool – definitely a fun place to go in a group if you do the BBQ….but note: you cannot split the BBQ’s for two for an individual BBQ…must be for two…no ifs ands or buts. You are currently browsing the archives for the *Hamamama category.